The key to happiness and well being. Yes I fink it rilly is simple! So here it is, haz a reed and see if yoo agrees too, and more impawtuntly see if we can all live by it. We get stuck in anxious, negative loops. So we seek out comfort where we can find it, and end up overeating, or paying too much attention to our smartphones, or otherwise constantly trying to distract ourselves. Fortunately, we can hack these automatic tendencies by consciously building new mental habits. The brain has the wonderful ability to make things automatic. When you have awareness that you want to be kind, and then you practice it, you’re essentially rewiring the compassionate part of your mind. When you notice an irritated thought, redirect your mind. Don’t try to be kind right away; it will only annoy you further. Instead, take a breath and see if (counter to your automatic thoughts) you have what you really need and are basically OK.
Our physiology is hardwired to recognize this simple gesture as self-soothing. the hand-on-heart exercise works because the human nervous system is responsive to touch; like babies, we respond to being held by relaxing and calming down. That touch also brings us back into connection with our bodies and, in particular, our breath. It seems weird at first, when you start practicing this. But your mammalian system kicks in immediately when you place your hand on your heart. You begin to use a warmer, gentler tone with yourself and with others. Often, kindness is just about stopping in your tracks and becoming aware of what you have. Many people are so wrapped up with their to-do lists that they treat people as obstacles, or as a means to some end that’s related to achievement. Why not slow down and really spend time in someone’s company? To do so is a gift to both you and the other person. The practice of being present in the midst of other people — not checking your phone, not rushing to deliver advice as soon as someone starts describing a problem, not scheduling social engagements back to back — can have profound effects. That’s what happens when we’re truly present with each other. You inspire other people to do the same for you. Giving to those in need is a beautiful act, but how you think about that gesture is important. “Giving” is noble, but the notion of “charity” is inherently limiting. It doesn’t recognize how much we have in common with those we want to help, and it places us above them instead. Humility is one of the key ingredients to kindness. When you’re being kind because you believe you’re better than someone else and they need your pity, then giving is less meaningful. Pity sets up a hierarchy. It leads to us projecting our needs onto other people, not seeing what they truly need. Instead, keep in mind that we all are vulnerable and need help in our own ways. The kindness of generosity flows in all directions, including toward you. It feels good to give; you get something out of the interaction, too. Being preoccupied with acquiring material wealth can lead to unconscious unkindness. But even having money on our minds (which is hard not to do when we’re constantly encouraged to make and spend more of it) can be enough to make us less friendly. Overcoming the influence of money on our behavior involves staying conscious of our scarcity mentality. That sense of scarcity is insidious and it takes engagement and mindfulness to run counter to that. While any positive interaction boosts our baseline well-being, it’s good to bring our kindness practice home, not least because it can be more difficult to be warm and caring toward the people we see routinely — and who occasionally annoy us, bore us, or treat us rudely. If we can rise to that challenge, we know we’re really growing. When we think about kindness, we often imagine these grand gestures, but we don’t need to join the Peace Corps to create more compassion in our lives. Start by looking closer to home. How do you treat the people you live with? In our quest for kindness, challenges are inevitable. Someone will always be driving slow in the fast lane or passing on the right. Mean-spirited gossip will forever be circulating. There will always be lines, angry online commenters, personal upheavals. And that’s OK.
It’s better to see this as a playful adventure rather than a project that needs to get accomplished. You’re trying to rewire yourself for a greater sense of well-being and purpose in the world, and that requires some lightness in your attitude. Once you become too aggressive or serious about it, then you’re going the wrong way. One trap many people fall into is thinking of kindness as an achievement. This creates an idea of an endpoint: You did all the right things, so now you can check “being kind” off your to-do list. A better approach is to strive to develop a growing awareness of what happens when we stray from kindness, and then gently direct ourselves back toward the compassionate path. You can cultivate kindness by simply inviting yourself to begin again. I fink to sum all dat up in one sentence is 'treat others as you would like to be treated yourself' and how duz we like to be treated? With kindness, empathy, understanding and love. So afta all dat waffling by da sykyatrists an siyontists I'll abbreviyate it Bonners style. Itz now scientifickly proved dat bein kind, understanding and loving towards evfurryone keeps yoo healthy an happy. Corse it dunt stop yoo gettin nasty diseases but I fink if yoo got one of dem, being kind and loving to others makes yoo feel better so dats good innit. Twitta went wonky on me yesday an sevral pals had Twitta relayted problums so me fort I wud do a page dedicayted to Twitta to help pals understand it a bit more. 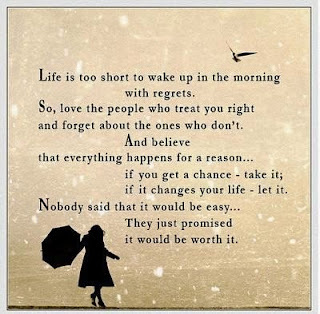 Itz still a mystry to me but some ov it mite be helpful. Well now update on hoouncle who yoo know iz still in hospital an not likely to come home but knowin how desprate da hospital iz for beds, nuffin wud surprise me. He still angin on bless him. Muvva still goin back and forwars to hospital evfurry day and we left to guard da house. But da good news iz he now on da proper ward he shud haf gone on 2 wks ago or howeva long it woz he got admitted. An he haffin da drain fing put on his tummy dis afternoon. Ovver day muvva got upset cus housing officer came round an sed sumone had complained about dogs barking all da time. Muvva knew who twoz, we got a grumpy old toad lives near us who iz a total bully and he upset muvva wen we furst moved in. So muvva sussed him out and got his ticket marked *nods*. Housing officer sed 'dis person' shud haf confronted muvva drekkly an not gone behind her back straight over her head to da housing officer in da furst place. Anyways housing officer sed 'dis person' cos she cudn't name him had told her us dogs were barkin non stop all day. Dis not true. Yes we barks wen sumone ring door bell, dats our job! An we barks for one or two minutes wen muvva gets back after leavin us to visit hoouncle or shopping, but we iz quiet rest of da time. Muvva leaves radio on for us and we go sleep. Muvva told housing officer dat she havin to leave us more lately cus ov hoouncle dying in hospital and Housing officer sed as it excepshonal circumstances she wud tell 'dis person' and hopefully dey wud be sympafetic. But she sed 'dis person' is also concerned about da duckies. We is allowed to haf 6 chickens here, so muvva assumed 4 ducks wud be allowed insted of chickens. So muvva told housing officer about duckies and dat dey wont fly over fences into peepuls gardens, dey not make a noise and dey dunt need a pond so wont make a mess. So housing officer was gonna check to see if duckies is allowed. If not we gonna haf to rehome dem. So den muvva rang da housing association and told dem and poor muvva woz really upset ontop of all da worry about hoouncle. But da lady at da housing association woz really nice and was really angry wif da person dat complained. She told muvva to put evfurryfing down in an email dat she had told her and send it to da main housing officer and da main assistant. 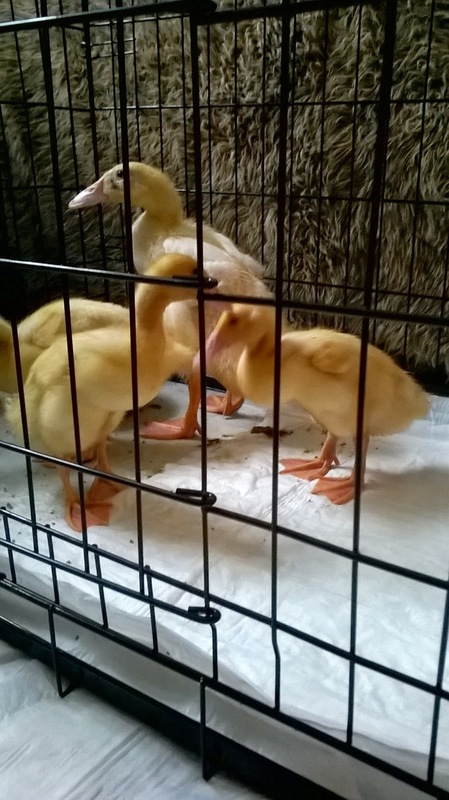 And not to worry cus we wouldnt lose our home or have to rehome doggies, but woznt sure about duckies. Honestly pals, sum peepul are so nasty and petty and got nuffin better to do wif dere lives dan make trubble for ovver peepul. I so glad dogs int like dat. So we iz waitin now to see wot happenin about our duckies. Muvva will be really upset if she gotta rehome dem, cuz she loves dem and dey iz very happy here. 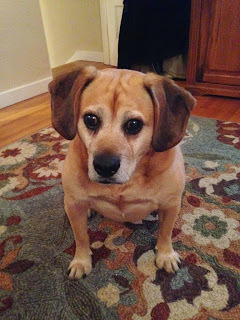 As for da rest of da fambly, furbro Mojo gotta go to vet at 4 pm today, da last checkup on his mouf to see if da stitches is dissolvin propply, and Gizmo gotta go tomorrow for his. Muvva woznt gonna go to hospital to see hoouncle this evening, cus she feeling so tired, going backwards and forwards as it long journey and it holiday time now and roads are very busy. Plus da expense of fuel and parkin and stuff. But she still gonna go. Well dats about all from me today pals, I iz worn out now afta all dis riting, so gonna go and haf a snooze. Hope yoor all haffin a grate day my fwends! Today I lurnt dat a Twitter fwend went ova da Rainbow Bridge last week. 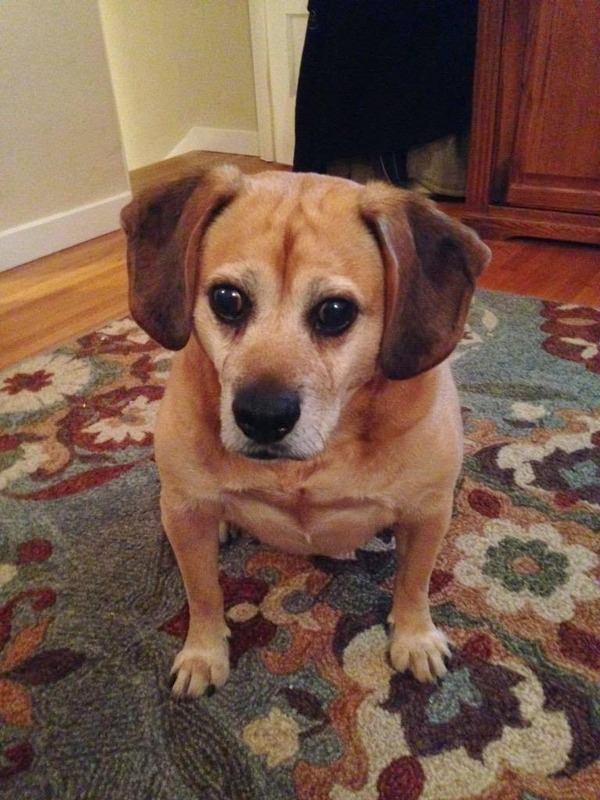 Louie @RonCWhiting from San Francisco, USA. He woz diagnosed wif SARDS in February dis year, I fink he also had Cushings. So he had boff diseases dat me got. I woz diagnosed about da same time if yoo rememba. His fambly tweeted my aunty Marulin @marilynwinders to let her know he had passed away, and said he had been haffin an increasingly tough time dealing wif his illness and went OTRB fairly suddenly. His fambly miss him vewy much. It woz a shock to hear of Louie's passing, I am doin ok at da moment on my medicashon, but it woz a bit of a wake up call to hear poor Louie hadn't had such a good long journey to da bridge. Muvva woz vewy shocked and had got used to me doin ok and da drugs keepin fings under control for da time being. It iz easy to forget dat I iz on borrowed time wen fings are going along ok but death lurks closely for all us Cushings dogs, and we never know how long we have wif our loved ones. I fink muvva woz sort of blocking da inevitable out ov her mind, seeing me doing well and happy at da moment, I guess it's her way of coping wiv da situation, I dunt know, I dunt understand hoomans way of finkin sumtimes. But I wud guess dats how dey copes. Hearing about dear Louie brought the whole horruble fing to da front agen and it's like hearin da bad news all ova agen. But knowin me muvva she'll soon pick herself up agen and be happy. Me dunt like to see her upset cuz it upsets me. I give her cuddle in a minit. She likes cuddles. So if any of yoo my fwends iz readin dis and yoo haz Cushings, remind yoo muvvas and farvas dat yoo might be well at da momunt, but dat can all change in da blinkin ov an eye, and dat dey must give us extra love each and evfurry day, like dey shud even if yoo not got Cushings rilly. Love each ovver my fwends, wile yoo can hold each ovver hang on tight and wispur "I loves yoo" it makes yoo and our loved ones feel so much better. I shall light a candle for dear Louie now, and dry my tears wif my paw and wish him peace and everlasting love over da bridge wif all our pals alreddy dere. If yoo wud like to light a candle for him too, da link is in da tabby fings under me main pic on home page here. Sorry for not updatin yoo for ages, but wif hoouncle haffin 2 terminal illnesses now poor muvva dunt know if she comin or goin. But she got more time now to let me scribe me life events. He stayed wif us for 2 weeks as yoo knows. Muvva woz run ragged lukin afta him cuz he juz sat on da sofa all day and expected to be waited on an muvva bein muvva did juz dat *rolls eyes* Da problum woz she not know if he was rilly too ill do get up to make a drink or somefin to eat or if he woz juz enjoyin bein waited on. But muvva did it wivout moaning at him. Da NHS and social services wudnt give muvva any help all da time hoouncle was wif us and muvva fort dat he wud be much betta in himself if he woz back in his own home ware he wud haf to get up and do fings and dat wud take his mind off his illnesses. Well muvva hopes dats wot wud happen. So last Monday she took him home afta spending da week before cleanin his bungalow so it was all nice and sparkly for him to move back in as he'd not dun nuffin to clean it for at least a year. She arranged a cleaning lady to call once a week to help him keep ontop ov it too. He seems to haf settled in well, and does do fings for himself now although da kitchen and baff room needs a clean up agen but not as bad as it woz. Da cleaning lady will sort dem out. Hoouncle is also more cheerful wich is good, and as muvva fort, he not dwelling on fings so much. I fink he realises now he not gonna drop dead instantly like he did when doctor told him he got da C word as well as cirrhosis of da liver. Muvva sez it natural wen hoomans hear da C word dat dey fink dey only got a few days and fink about orderin da flowers and da hearse *rolls eyes* but once dey iz over da shock dey realise its not juz days but dey got munfs or even a year or two so dey start to do fings before it too late. Fink hoomans call it a Bucket List. Me didn't know wot a Bucket List woz so muvva told me it means a list of fings to do before dey 'kick da bucket' < dat means die to us. Hoomans is very daft fings at times int dey? So dats all about hoouncle. Muvva much more relaxed and got her energy levels back up wich is good cuz we needs her fit and healthy to take care ov us. bol We also got new memba ov da fambly, well he old memba rilly but new to living wif us since hoouncle went into hospital furst. An dats couzin Gizmo, hoouncles doggy. He's 7yrs old same as me, and a boy same as Mojo. So fits in well and we now a pack of 3 doggies. But me told yoo all dat in me last blog fing, sowwy, me gettin like muvva and repeatin meself BOL. Muvva took him to vet cos he had bad teef and hoouncle sed if he needs anyfing done he wud pay for it, so vet had a look and saw he needed da plack taken off his teef and one had to come out cos it woz black and rotten. He had dat done last Thursday, and was back to normal da next day. He had his post op check yesday and vet sed all ok and healin up nicely, so dats good. On Friday Mojo had dental done. He had broken a big back toof on an antler chew. Muvva has frown all da antler chews in da bin now, so none ov us can haf dem. Pffffft Mojo's toof was more complicated to take out dan Gizmo's. Cos it had fractured and broken in da bone and had to be cut out so he got mouf ful of stitches and he weren't well at all wen muvva brort him home. But he on painkilling liquid stuff and antibiotics wot mum haz to rap in cheese so he takes dem. Today he seems almost back to normal so I wud say, if me cud count dat high dat he about 99% back to normal. He was a pitiful sight da last couple days and kept whimperin wif pain but he ok now. I got me fat brofur back so me pleased. Woznt keen on da fat grumpy bro much bahahahaha. AND..... and..... we got even MORE membas ov da fambly pals. Yes tis troo. As yoo may or may not knows if yoo not kept up to date wif me scribin pfffft dat we got extra big garden here in da noo housey. Much too much for me poor old muvva to care for, so she divided it up so she got small pretty flower garden and a gurt big side garden wots got fruit trees in and grass. Well getting back to da new membas ov da fambly, we got duckies! Baby duckies. Dey weird pals. I mean rilly weird. Dey not like normal duckies, not dat me eva seen proper ones, but if I did I bet dey wudn't look like deez duckies look. Dey is upright like hoomans. *shocked eyes* I reckon dey iz zombie duckies. Wook! Deres one big one Duckzilla, dats a gurl duck, and 3 little ones, 1 ov wich is a manduck and ovvers iz gurls. She sez she callin da manduck Arfur Daley but she gotta fink up some good names for da 3 gurl ducks. Duckzilla is bigger cuz she is 2 weeks older. Dey is all same breed evduntly. 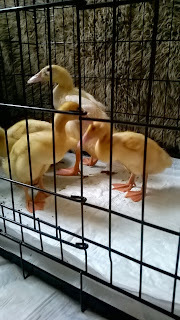 Muvva shown me picfurs and she put picfurs on here ov grown up duckies, but deez baby duckies is juz as weird only yellow insted of white. Dey stinky fings too. Muvva foreva changin da puppy pads in da dog crate ware dey iz at da moment. 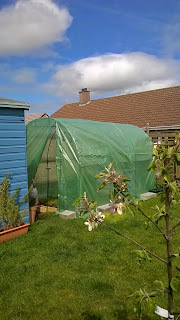 We still waitin on da man comin to do da fence dividing da orchard from da flowery garden, so dey can't go out in dere new house yet, so muvva got a polytunnel greenhouse fing. She had a lean to aluminium one from freecycle last year, but found out it cost too much to get a man to erect it and glaze it, so she bunged it on Ebay. Yea I know, da cheek cos she got it for nuffin. But dere woz method to her madness, dere is sometimes, we dunt always see it, but she not qwite knitting wiv only one needle juz yet. 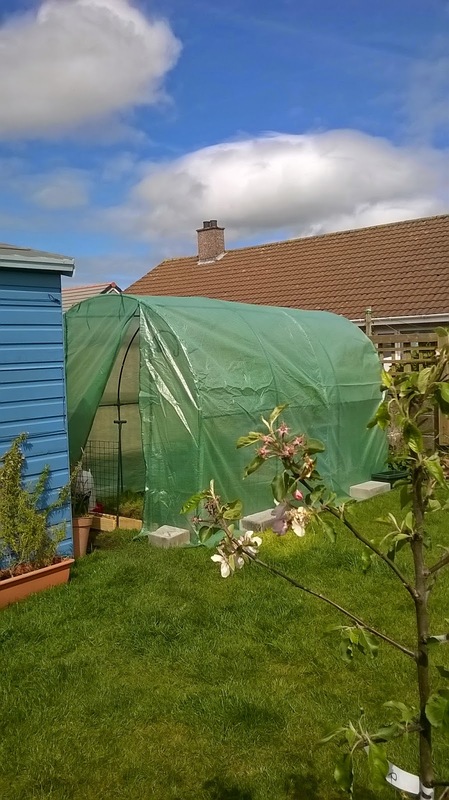 Da money she got for da lean to greenhouse paid for da poly tunnel one. She cleva int she. We fink so. So yesday she was out in da garden putting da frame togevva and den putting da plastic stuff on it. She didnt do a bad job, and it all went to plan she sed.But da air woz blue at times pals, I heard her muttering dat vewy rude word a few times, da one dat starts wiv 'F' yap troo. We woz shocked. She dunt often say 'flippin' but she did yesday. Anyways, da struchure is up and looks ok. Here's a pic or two ov it. Nuffin to rave about but it'll grow her some good tomatoes she sez come summer. So duckies will be going out into dat either tday or tmorrow cos I see she put dere house in dere. I fink dats so da crows and buzzards wot fly overhead dunt swoop down and carry duckies away. Once dey big burds dey be safer. I got me next ACTH test sometime in da summer so long time away yet. We hopin me can stay on lower dose of Vetoryl still but its out ov our control an we mustnt worry bout it til we haz to. So now yoo iz all up to date wif me egcitin life, and now we not got hoouncle at home muvva got more time to let me scribe me wafflings to me pals. I hopes yoo haffin a grate Sunday and keepin safe an well. Wememba to be kind and love each ovver, deres not enuff love in da wurld so we gotta spread it around more.